Breaking Bad star Bryan Cranston has been itching to play a Marvel villain, and now we know who he has his eye on. This past weekend at New York Comic-Con, the actor revealed that would relish the opportunity to play longtime X-Men nemesis Mister Sinister on the big screen. Thanks to the Internet, we now have an idea of what Cranston would look like as the pale-skinned super villain. Twitter user BossLogic has posted this image of Cranston in Mister Sinister form (via Comicbook.com), and it looks spectacular. Known for his photorealistic style (recently showing what Tom Hardy would look like as Wolverine), the artist has taken the actor’s visage and captured Sinister’s spirit both in look and attitude, from the glowing red eyes and forehead diamond to the elaborate cape swooping over him. Aside from voicing James Gordon in the animated Batman: Year One movie, Cranston hasn’t had the opportunity to delve into comic book projects, so playing Sinister in live action would be a great score for him. 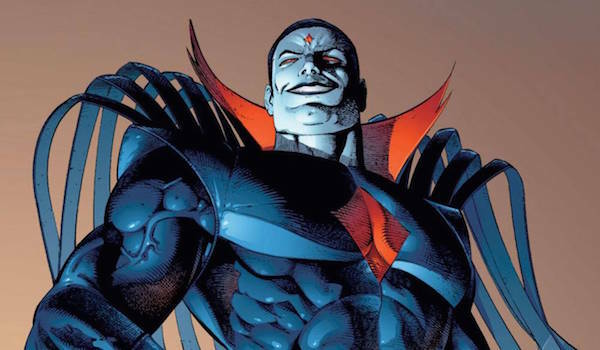 The X-Men movies have already introduced many of the superhero team’s biggest enemies, but Mister Sinister is one of the few that hasn’t been adapted yet. Making his comics debut in 1987, Sinister was originally Nathaniel Essex, a biologist from Victorian era England. Believing that morals were holding him back from making true progress with his experiments on evolution, he allied himself with Apocalypse and was genetically mutated by the ancient Egyptian, giving him abilities like prolonged life (allowing him to antagonize the X-Men in the present), regeneration, shapeshifting, energy projection, and more. Sinister has previously appeared in animated shows like X-Men: The Animated Series and Wolverine and the X-Men, as well as video games like X-Men Legends II: Rise of Apocalypse. The main X-Men film series as we know it will conclude next year with X-Men: Apocalypse, but depending on if Apocalypse makes it out of the 2016 blockbuster alive, there may have to be adjustments made to how Sinister comes to power in the film universe. Sinister is too good of a villain not to use in the movies, so retconning his background might be necessary. If Sinister won't get the opportunity to appear in one of the primary installments, maybe there’s a way he can be incorporated into one of the spinoffs, be it a solo feature like Gambit or another team movie like New Mutants. Right now Cranston playing Mister Sinister is just a dream, but for many, perhaps it’s a dream worth realizing. In the meantime, you won’t have look far to see Cranston on screen in the near future, from playing screenwriter Dalton Trumbo next month in Trumbo to playing President Lyndon B. Johnson in the HBO film All the Way.